These days it sure does seem like there’s a new diet for type 2 diabetes popping up all the time. Just about any diet will work in the short term. But diets rarely work long-term. According to a study published in JAMA not too long ago, it showed that popular dietary programs for type 2 diabetes are difficult to maintain. Most of them (like Atkins) had around a 50% drop out rate at 1 year on the diet. With the Weight Watchers and The Zone diet fairing a little bit better with around a 35% drop out rate. So, while they work, they are hard to make a part of your lifestyle. The truth is, until you can make a permanent lifestyle adjustment, no temporary diet is going to fix things. I was recently asked my thoughts on the Keto Diet for Diabetes. And while it’s seeing a resurgence in popularity these days… the high fat, low carb diet or Atkins diet, which is like the Keto Diet… has been around for a long time. And while I’m uniquely qualified to share my knowledge here, being that I’ve been working in the diabetes market in Big Pharma since 2003… 9 times out of 10, I usually come back to the same conclusion – diets don’t work. You see, the key to controlling type 2 diabetes is making anything that you do part of your lifestyle. It also needs to be customized. Something that fits YOU and your body. Like a glove. You must remember to keep this in mind. 75% of your daily calories from fats like avocados. 5% of your daily calories for the day are supposed to come from carbohydrates. The key concept with this diet is that your body is using fat for its energy needs instead of sugar (glucose). This diet has become popular for diabetes because of the notion that it will lead to better blood sugar control since you’re eating fewer carbs, which break down into sugar. As we know carbohydrates can raise your blood sugar more than any other food. In most cases, losing weight results in improved glycemic control. So this one of the major pros of this diet. The biggest health concern with this diet is the buildup of ketones in the body. So you’ll want to test your blood sugar regularly as well as your ketone levels. Normal ketone levels are < .6 mmol/L with anything above that point needing to be monitored. Ketones are toxic to the body. I’m not personally a fan of a diet that requires me to test my ketone levels. This doesn’t feel natural to me, but some people are OK with this and do well on the diet. The way the whole process works when your body is using fat for its energy needs, it’s important to think of it this way. Insulin is the key that unlocks the door or your cells to allow glucose (sugar) in. Without sugar (low carbohydrates so lower glucose reserves) to use for your energy needs, your body begins to burn fat for energy that the cells of your body need to survive. As a result of fat metabolism, acids called ketones are released into your urine. You want to be careful with this and work with your doctor. With the keto diet or ketogenic diet for diabetes, I’m a firm believer in – don’t knock something until you try it. Yes, most carbohydrates can be broken down into sugar and they raise your blood sugar more than any other type of food. But it’s important to note that the brain and the spinal cord, because they can’t store glucose, depend on a continuous steady supply of sugar from the bloodstream for their energy needs. If your blood sugar gets too low you can start to get irritable, fatigue, confused or worse. So please keep this in mind. As with any diet it is important to check your blood sugar levels. 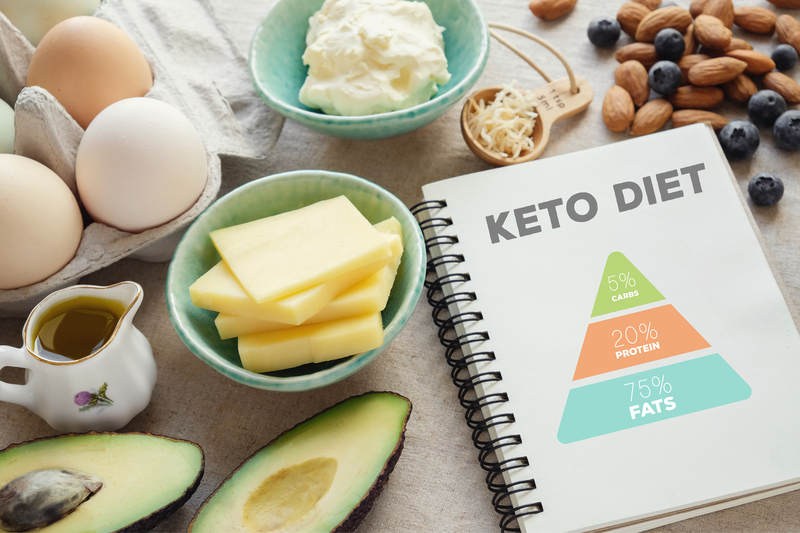 A big component of The Keto Diet is you’ll burn fat for your energy needs, lose weight, and since you aren’t eating many grams of carbs, your blood sugar will improve. I felt completely zapped after a few days because my body needed more carbs than the recommended amount for this diet. My energy reservoir felt depleted. I couldn’t hack it long-term because I ‘felt off’. Light headed and stuff like that. First, some tissues of your body are glucose dependent as I mentioned above. Like your brain, kidneys, digestive lining, and even red blood cells. These cells can’t store sugar and depend on a continuous supply from the blood. Without getting too clinical here, my only concern is that other things can go awry in the body when you go super low-carb. Your body needs carbohydrates. So just keep this in the back of your mind as food for thought. I recommend you also give it a go and see how it works for you. If you can make this a part of your lifestyle long-term, then it might be right for you. Each of our bodies is different. Sometimes experimenting is a good thing because you might find something that feels like the right fit. We’re all wired a little bit differently. But remember, your brain is glucose dependent and needs sugar for energy. Some diets can be restrictive and have dangerous consequences if you’re not careful. So, tread lightly. Finally, I have heard some amazing success stories with the Keto Diet from diabetics (and non diabetics) and I do recommend it. And I especially recommend trying it over a life of dependence on diabetes medications, which ALL fail over time. If you’re trying the Keto diet and you have type 2 diabetes, always remember to check your blood sugar and see what your body is telling you. Because low blood sugar levels, just like high levels can be dangerous. If you’re giving this a try, I’d love to know how it’s working for you. Please share. And as I always preach, make this a permanent lifestyle for you and you’ll see results for years to come. Prior to using any of this information please consult with your doctor and your diabetes healthcare team.